I Love You More Than Carrots: Six Years. Two Point Five Babies. So Much Love. Six Years. Two Point Five Babies. So Much Love. It was six years ago this weekend that I pledged my life to that blonde-haired, blue-eyed fraternity brother I'd met at a party four years earlier. Six years ago this weekend that I slipped into a beautiful hand-beaded white gown with the help of my closest girlfriends and while they stood by me, promised to love and to honor that man all the days of my life. 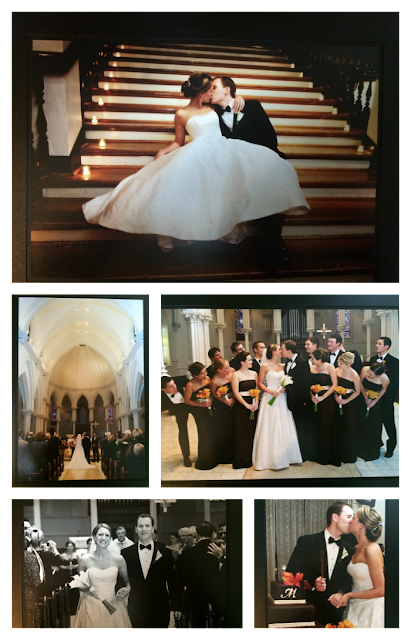 Surrounded by family and friends inside the beautiful marble and stained glass walls of the Villanova cathedral, I had no idea the life we would begin to build together. We were so young but so madly in love and we were confident that, no matter what the future would hold, we would tackle it together. That was all that mattered. What a six years it has been. Perhaps even the best six years of my life. Some days it feels like just yesterday I was walking down that aisle towards him. Most days it feels like a lifetime ago. Whomever said the first year of marriage is the most difficult surely wasn't about to have three kids in under four years but I wouldn't trade experiencing those late nights and early mornings, the sheer exhaustion, the frustration of those newborn days (and let's face it, parenting the wild two's and super, awesomely trying three's) with anyone else. Our marriage and our life is far from perfect but it's perfect for us and it's beautiful and it becomes even more perfect and beautiful as the days pass on. I wouldn't trade these every days for the world. Our life has been so full these last six years and although we've had our fair share of sacrifice, of compromise, of hurdles and obstacles, I still wake up each morning grateful to be walking through life with him at my side. And the great moments? Are so great. So full of love and laughter and they outnumber the less than great moments by the hundreds of thousands. We really do make a great team and we've both worked so hard to create this beautiful life, and this beautiful family that we're living together. Six years later and I'm even more proud to be his wife and I look forward to reaping the benefits of our hard work in the years to come. Here we are, expecting our third baby and about to begin yet another new adventure, one that we both feel will complete our family and I can't help but become overwhelmed with excitement when I think about how I get to spend the rest of my life living, loving and raising these beautiful babies alongside him. It can't get much better than that. Thank you for being so patient with me and loving me wholly, completely and selflessly. I can only hope you feel just as loved and appreciated each day that I do. Happy Six Years, Husby. You're simply the best. Happy anniversary! We celebrated 6 years in August! Happy Anniversary Mr & Mrs M!!! Happy Anniversary! Our 6 year anniversary was 10/6! Brought tears to my eyes. Beautiful! Love the love, Mr. & Mrs. M! Congrats on 6 fantastic years and many more! What a lovely dress, beautiful bride, and sweet, sweet post. Happy anniversary to you and Mr. M and cheers to the beautiful babes you have brought into this world! Here's to 60 more! Happy Anniversary. I would say if you weren't already .5 babies in, you would be after tonight ;) May you have a lifetime to enjoy each other! lovely! happy anniversary to you both! Happy Anniversary! This is the first time I've seen these pictures. So sweet. Your dress was GORGEOUS. Wow, stunning wedding photos! You guys seem like an amazing couple. I'm still a newlywed, but hope our love is as strong as yours when six years rolls around! Happy Anniversary! You have very beautiful wedding pictures too! You guys are so pretty and adorable. beautiful...and you look exactly the same as you did 6 years ago! Happy anniversary!!!! My husband and I have only been married for 3 months but I hope our love is still this strong in 6 years!!!! I just had to calculate how long we've been married. Ha! It will be 17 years next May! I can't believe it! Happy Anniversary! You two look so in love - and haven't changed a bit in six years! Beautiful pics. Happy anniversary! I agree, I never knew why "they" say the first year is the hardest. you are as beautiful of a mother & wife as you were a bride! Absolutely beautiful.... thanks for sharing with us! I know I'm late on the blog comment but happy anniversary! I'm A Dirty Little.. Vacuum-Lover. It's Beginning To Look A Lot Like... Halloween? Baby M3 :: Fourteen Weeks! A Family That Plays Together, Stays Fit Together. Not Your Typical Four Eyes And A Day In Our Life. I Do My Best Before Bed. I've Been Keeping A Secret.